Once in the reserve we checked out the nearby grass experiment exclosure. There are several 5m by 5m plots in the reserve and beyond. Each has been surveyed to establish which plant species are present and soil samples have been taken for analysis. Then treatments have been or will be applied including adding sugar to change the nutrient balance, slashing and weighing the plant-mass and control-burning. 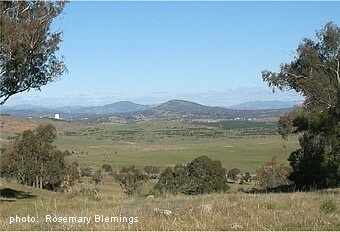 The fenced-off area excludes rabbits and kangaroos allowing the comparison of how grazing pressure influences plant growth. Plenty more detail on the Friends of the Pinnacle website. As we moved through and over the grassed area there were several places where kangaroos had been resting. The grass was pressed flat and scats were present. We came across an isolated tussock which looked very much like Serrated tussock an introduced grass that has invaded many areas including the paddocks of the Monaro. In hindsight my identification was suspect. It was probably an isolated Poa tussock, Poa sieberiana which seemed slightly yellow and stiff-leafed compared to other nearby grasses. Later we came across several patches of Kangaroo grass a common native, noticeable by its characteristic flower and seed-head. There are several huge Eucalypts in this easterly part of the reserve. They've remained as shade trees in spite of the policy of land clearing the early settlers complied-with. We discussed how bark, low-down on some 200-300 year old species, could act to reduce the effects of fire. Some barks were much whiter and showed either the classic scribbles or the wrinkled 'armpits' on bark that aids identification. 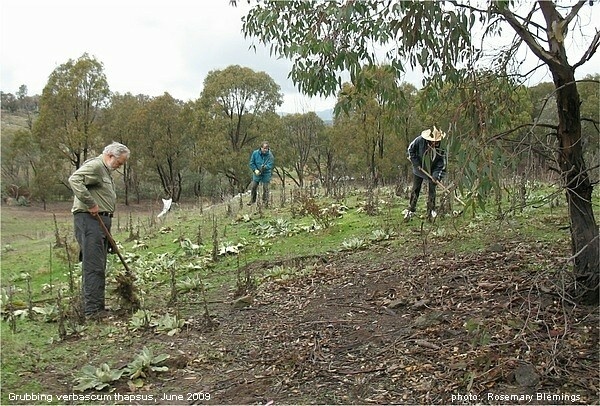 Some of the old trees are surrounded by saplings but eucalypts can inhibit the growth of offspring until they themselves are weakened by age or poor-health. Rust-coloured upper branches indicated new-season's growth and on one sapling we found a squirming cluster of small Spitfire larvae. The younger trees to the east of our route were amongst those planted between 15 - 20 years ago. In reaching a rocky ridge we passed several Cauliflower bushes (Cassinia spp.) and began a discussion on common names (sometimes misleading) and plant names in general. Some of the most complicated names actually reflect the habit of naming species after botanists who've made significant contributions or those who have made the first discoveries. There were lichens on rocks and boulders, mosses nearby and Rock ferns thriving on the constant temperatures and moisture in crevices or almost under rocks. These plants with ancient lineage are able to absorb rainfall and dew instantly and revitalise themselves in damp conditions. Lichens are algae and fungi in symbiotic relationships and they also have the capacity to decompose the rock surfaces they cling to forming soil, incredibly slowly, as they do so. On bare ground lichens are essential initial binders-of-the-soil. Rain falling on their 'leaves' is deflected and therefore has less erosion-power. Where the feet of hard-hoofed animals such as horses, cattle and sheep cut into or compress the lichens the soil is laid-bare for erosion to take hold. Australian grazing animals have softer feet and little or no impact on these essential, delicate, colonising plants. We were watched all the while by a large mob of (30-40) Eastern grey kangaroos. Their camouflaged presence was only revealed by their twitching ears or the movement of an occasional scratching paw! There was the query about other Pinnacle mammals. Echidnas are seen but not wombats. Possums and bats would be active at night. This season there would have been mice but probably all the native small mammals are long-extinct. Perhaps we should have an expert-lead spotlighting visit to see what's around after dark. There was no shortage of rabbit dung and scrapes where they'd dug for roots, bulbs and corms. Near a drain there was a foxy smell. The Pinnacle is well-endowed with reptile species and there's a list on the website. The dam is surveyed by Frogwatch volunteers. There were patches of Lomandra growing with tough, strappy leaves that Indigenous people used for making baskets and mats. Lomandra longifolia is widely used in landscaping but has broader leaves than the grazing-resistant species we saw. There were several healthy shrubby plants waiting for warmer temperatures before their buds would be closer to flowering. These rocky areas act as refuges for the area's original plants and were visited by members of the Australian Native Plants Society last spring. The results of their surveying added or confirmed many native species to the reserve's plant list (also on the website). Cherry ballart (Exocarpus cupressiformis) trees had several immature fruits that prompted a short "bush-food" discussion. The Cherry ballart's leaves are similar to those of Callitris pines and Casuarinas but it is a semi-parasite on the roots of nearby plants. A solitary Indigofera australis was, unusually, amongst grasses some 5-10 m from other shrubs. It showed that some plants have to be pioneers, having no choice as to where their seeds are carried. It didn't seem to have been nibbled which quite often happens to this species in the woodland. Views towards Woden and Mt Stromlo prompted discussion about the threat of development to open country/farmland south of William Hovell drive. Although the planners' dream of another dam and a lake on the lower Molonglo have been thwarted there will be significant changes for the fauna and flora of the river corridor even if the riverine and buffer-zones are generous. We paused to examine Verbascum rosettes ... the first weeds tackled by the new Pinnacle group nearly two years ago and the target of their hoes and spray-packs since. There was a healthy Fleabane plant (Conyza bonariensis). This species is the principle, current target of detailed weeding in the forest area at the western end of the reserve by a small group who volunteer fortnightly. There were New Holland Daisy (Vittadinia gracilis) plants re-colonising ground near and amongst the rock and boulders. The almost skeletal remains of a mistletoe on a dead eucalypt reminded me of the male Mistletoebird we'd seen several weeks ago and its navy and bright-scarlet feathers. Leaves close to the ground were those of the Stinking pennywort (Hydrocotyle laxifolia)a common native with a reputation for its off-putting smell in late spring. There was plenty of sorrel growing amongst the rocks. A member of the Oxalis species, it's a very plentiful weed though useful to us because it illustrated the point that some plants' leaves have a reddish tinge in winter. Presumably this is a defence against the cold or helps to make the most of absorbed heat from the sun. Thanks again to those who came on the walk and made it so enjoyable.